For Admiral Squish's Tryor, a campaign setting shaped by the mutagenic skills of its Illithid overlords. Chimerans are a race of strange, widely-varied humanoids. An unintentional creation of the shapers, the chimerans are the result of thousands on thousands of failed shaper experiments interbreeding and mixing until their genetic makeup is impossible to predict from one generation to the next. The chimerans dwell in scattered communities throughout the world, though many still live near Myralis, and some ever remain within it, in scattered communities clinging to life among the ruins. Personality: Chimerans are a fiercely individualistic people. No two chimerans are quite alike, in both small, inconsequential ways and large, important ways. As such, chimerans generally find it impossible to judge others by their appearance, preferring instead careful consideration, weighing the individual’s merits and flaws. Chimeran children are raised to believe that such differences are a good thing, and that another’s talents compliment their own. As such, chimerans are generally quite good teammates. One thing chimerans all tend to feel at one point or another, is that nobody understand them. Each chimeran is completely unique, so it’s difficult to find others who understand their specific problems. Some respond to this stress by throwing themselves into their jobs, seeking to create an identity through their efforts, while others constantly wander, hoping to find some place to belong. Physical Description: Chimerans vary widely from one to the next. Some have sharp teeth or claws and scaly skin, while others have lime-green hair, pointed ears and gliding flaps. Chimeran hair, skin, and eyes range through all colors of the rainbow, from snowy white to jet black, and all stops in between. Some have small spikes instead of hair, or wriggling, wormlike tentacles. Some have slit eyes like a cat’s, or solid black, featureless orbs, or large, doe-like eyes. All chimerans share the same basic structure however, with an overall humanoid body type, standing between 5’6” and 6’, with somewhat wide, rounded shoulders, and weighing in at between 100 and 180 pounds. Males and females share pretty much the same average in height and weight. One interesting quirk of chimerans is that when chimerans bear a child, the resulting offspring only rarely shares any traits with it’s parents, even if both parents share the same traits. There is a tendency for certain traits to make their possessors gravitate toward certain jobs in chimeran culture, but it is not nearly as pervasive as it is in some cultures. Most chimerans reach maturity at 20 years and can live between 100 and 120 years. However, some mature and age faster, while others grow slower. Relations: Chimerans in non-chimeran communities are universally outsiders to one degree or another, often viewed as curiosities at best and freaks at worst. The reverse is not true, however, as outsiders of most races can blend almost seamlessly into chimeran communities. Chimeran communities are often small, with many of their more individualistic members heading off to travel the world or live among other races. Chimerans are generally a friendly people, albeit critical. They can make no assumptions, so guests often feel like they’re being constantly judged. Alignment: Chimerans raised in chimeran communities are generally lawful, while chimerans raised in other communities are most often chaotic. Most chimerans raised in chimeran communities are good, while those raised elsewhere show no real preference for good or evil. The general number of evil outsider chimerans can lead to stereotyping all chimerans as chaotic and evil. Chimeran Lands: Chimerans were originally from the Myralis, the central metropolis, where they formed large communities, their varied natures allowing them to fill all the roles of the society. When Myralis fell in the aftermath of the illithid, they fled. However, some die-hard chimeran communities struggle to survive within the walls of the city, fighting off the smaller monsters and moving around to avoid the earthshakers. Language: Chimerans speak common almost universally. Most pick up other languages based on their location and the communities nearby, and some pick up more exotic tongues out of interest. Names: Chimeran names are relatively simple. The chimerans give their children a personal name at birth, along with a descriptive name, which describes one of the infant’s most prominent traits, like scalefang or glimmerwing. When a chimeran comes of age, he also chooses a name for himself to describe his profession or talents. This name can be changed at any time by the chimeran, though this change of name is taken quite seriously. Adventurers: Chimeran adventurers are quite common, with a good number of young chimerans seeking their fortunes as mercenaries or explorers. +2 Constitution, -2 Charisma. Chimerans are sturdy and reliable, but their strange appearances often make it hard for other races to know what to make of them. Medium: As Medium creatures, chimerans have no special bonuses or penalties due to their size. Emulate Race: Because of their radically mixed heritage, chimerans can use magic items that only function for a user of a certain race. This ability works like the emulate race function of the Use Magic Device skill. A chimeran can automatically emulate any humanoid or monstrous humanoid race, with no need for a skill check. Chimerans who have the Use Magic Device skill have a +4 racial bonus on attempts to emulate nonhumanoid races using that skill. Mutations: Chimerans are a genetic melting pot, and nobody knows the full breadth of the possible traits they will present with. Most of these traits are subtle features, like green hair or blue skin, but some of them are more complex. Each chimeran may choose his traits from the following list. A chimeran may not choose the same trait twice. Acid Spit: A chimeran with this trait shows very little outward sign of it. They gain the ability to spit a mouthful of acid as a standard action. This spit is a ranged touch attack with a range of 30 feat that deals 1d6 points of damage +1d6 points of damage for every 3 HD you possess. Claws: A chimeran with this trait has sharp claws on his fingers, and gains two natural claw attacks that deal 1d4 points of damage each. Club Tail: A chimeran with this trait has a heavy, muscular tail tipped in a spiny club, and gains a tail slap attack that deals 1d6 points of damage. Horns: A chimeran with this trait usually has one or more horns, branching antlers, or spikes, and gains a gore attack that deals 1d6 point of damage. In addition, if a chimeran makes a charge attack with their gore attack, the attack deals double damage. Hungry Maw: A chimeran with this trait possesses short, stunted fangs, or a circular, lampreylike mouth, and can drink the blood of it's victims. If a chimeran with this trait pins a living creature in a grapple, he may take swift action to sink his teeth into them and begin to drink their blood. This deals 1d2 points of constitution damage each round the target remains pinned. If the target breaks the pin, the chimeran's grip is disrupted. The target takes 1d4 points of damage, and continues to bleed for 1d6 rounds thereafter, taking 1 point of damage each round. This attack cannot be used against targets immune to critical hits. Ink Spit:A chimeran with this trait has thick, black saliva, which can be quite disturbing to outsiders, and gains the ability to spit ink as a standard action. The chimeran may make a ranged touch attack against a target within 30 feet. If this attack succeeds, the target is blinded by the viscous goop. The target must take a full-round action to clear the ink from their eyes. The target may clear some of the goop with a move action, but the target is dazzled and takes a -4 penalty to spot checks until they take a full-round action to clean their eyes out. Underwater, this trait functions slightly different. By taking a standard action, the chimeran may create a 5-foot diameter cloud of ink in their square or a square adjacent to them, which hangs in the water for one round per point of constitution modifier they posses (minimum 1). This cloud provides concealment for anyone inside the cloud, but creatures outside the cloud have concealment against the creature inside the cloud as well. The cloud provides total concealment to those on opposite sides of it. Whenever the chimeran uses this trait, either in it's spitting form or ink cloud form, they must wait 1d4 rounds before they can use it again. Poison Fangs: A chimeran with this trait has two, long, needle-like fangs that produce a potent toxin, and gains a natural bite attack that deals 1d4 points of damage. Up to (con mod)/day (minimum one), any living creature hit by this bite attack must make a fortitude save (DC 10+½ HD+con) or take 1d4 points of strength or dexterity damage (chosen at character creation) as initial and secondary damage. Scream: A chimeran with this trait can unleash a destructive scream as a standard action. This scream takes the form of a 15-foot cone. The cone deals 1d6 points of damage for every 2 HD the chimeran possesses. Any creature within the cone may make a reflex save (DC 10+½ HD+con) for half damage. Slam: A chimeran with this trait has large hands and pronounced, bony knuckles, and gains a natural slam attack that deals 1d6 points of damage. Swimmer‘s Tail: A chimeran with this trait possesses a strong, flat tail, and gains a tail slap attack that deals 1d4 points of damage. In addition, this tail grants the chimeran a +2 racial bonus to balance, jump, and swim checks. Tentacle: A chimeran with this trait has one or two long tentacles sprouting from somewhere on their body, and gains a tentacle attack that deals 1d4 points of damage. This attack has a reach of 10 feet. Tongue: A chimeran with this trait possesses a long, thick tongue, and can use it to affect enemies at a range. As a standard action, they may make a ranged grapple, trip, or disarm attempt against a target within 10 feet. The chimeran makes the relevant grapple or strength checks at a -4 penalty. If the target is sucessfully grappled, the target is pulled into the chimeran's space. This movement does not provoke attacks of opportunity. If the target is successfully disarmed, the weapon is brought to the chimeran's mouth, and may be spit onto the ground in his square as a free action, or passed to his hand as a move action. Web: A chimeran with this trait posesses a pyramidal structure somewhere on their body, and can use this structure to spin silk. The chimeran can produce up to 20 feet of silk cord per day per point of constitution bonus. Any creature coming or object coming in contact with this web must make a reflex save DC (10+½ HD+con) or be stuck to the cord. This cord requires a DC(10+½ HD+con mod) strength check to break or pull free of. Armored Hide: A chimeran with this trait has his body covered with scales, fur, or thick hide, and gains a +2 racial bonus to natural armor. 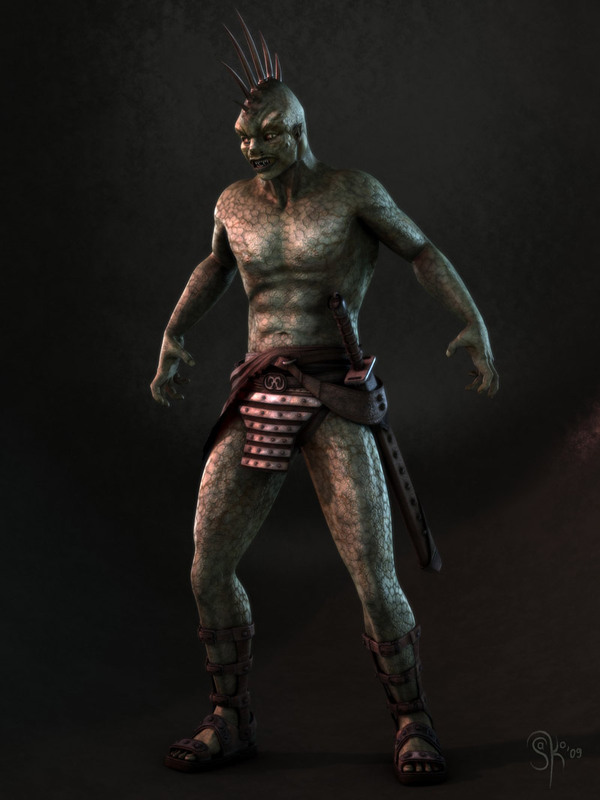 Chameleon Skin: A chimeran with this trait can change the color of his skin, and gains a +4 racial bonus to hide checks. Glimmering Skin: A chimeran with this trait has skin with a reflective sheen to it, and gains Spell Resistance 10+HD. Oily Skin: A chimeran with this trait secretes a slimy, oily substance from their skin when angry or scared, and grants them a +8 racial bonus on escape artist checks. Rapid Regrowth: A chimeran with this trait gains fast healing equal to his constitution modifier. Resilience: A chimeran with this trait gains energy resistance 5 against acid, cold, electricity, fire, or sonic damage. (chosen at character creation). Simplified Guts: A chimeran with this trait has simplistic organs that are extremely generalized. When a critical hit or sneak attack is made against a chimeran with this trait, there is a 25% chance that the critical hit or sneak attack is neutralized, and the damage is instead rolled normally. Thorny Hide: A chimeran with this trait has their skin covered with short spines. These spines deal 1d4 points of damage to anyone who makes an unarmed attack, melee touch attack, or natural attack against them, and anyone who makes a grapple check against them. They may also be used like armor spikes. The chimeran can suppress or resume this ability as a free action. Movement: Chimerans can move in many strange ways; choose one of the following mutations. Flippers: A chimeran with this trait has webbed hands and feet, or possibly a paddle-like tail, and gains a swim speed equal to his base land speed. They gain a +8 racial bonus to swim checks made to perform a special action or avoid a hazard, and may always take 10 on a swim check, even if rushed or threatened. Gliding: A chimeran with this traits possesses gliding skin flaps or weak wings. These wings can be used to glide, negating damage from a fall of any height and allowing 20 feet of forward travel for every 5 feet of descent. Chimerans with this trait glide at a speed of 40 feet (average maneuverability). Even if a chimeran’s maneuverability improves, they can’t hover while gliding. A chimeran can’t glide while carrying a medium or heavy load. If a chimeran becomes unconscious or helpless while in midair, their flight structures naturally unfurl and powerful ligaments stiffen them. The chimeran descends in a tight corkscrew and takes only 1d6 points of falling damage, no matter what the actual distance of the fall. Sticky Fingers: A chimeran with this trait has hands and feet that stick easily to any surface, and gains a climb speed equal to his base land speed. They gain a +8 racial bonus to climb checks, and may always take 10 on a climb check, even if rushed or threatened. Swift Legs: A chimeran with this trait possesses double-jointed legs or legs that are just exceptionally powerful, and increases his base land speed by 10 feet. Blind: A chimeran with this trait usually has milky white eyes, sealed eyelids, or shows no sign of having eyes in the first place, and gains blindsight out to 30 feet, and blindsense out to 60 feet, and can perceive the world through a combination of scent, sound, and vibration much like a sighted creature would. Additionally, a chimeran with this trait is immune to gaze attacks, visual effects, illusions, and all other effects based on sight, as well as all text-based spells or effects. A chimeran with this trait cannot read written words or activate scrolls. A chimeran with this trait that has it's hearing impaired by a spell or effect is limited to only it's blindsense. Extra Arms: A chimeran with this trait bears a second set of arms just under the first, though they're extremely small and relatively weak. Their weaker limbs are poorly suited to carrying weapons or shields, and do not gain natural weapons (even if the chimeran is under a spell or other effect that grants hand-based natural weapons), but they do an excellent job of providing stability and support to the upper limbs. These extra limbs allow the chimeran to use weapons one size category larger than normal without penalty. The chimeran's secondary arms must be free for it to gain this benefit. This benefit does not extend to larger weapons. For example, a chimeran can wield a Large longsword with a single primary arm without penalty by steadying the blade's pommel with its lower limb. A chimeran can wield a pair of two-handed weapons by using all four of its limbs. The chimeran gains the full benefits of wielding a two-handed weapon, such as 1-1/2 times its Strength bonus on damage rolls. The chimeran suffers the standard penalty for fighting with two weapons and carrying a non-light weapon in its off hand. If a chimeran carries a weapon or shield in its secondary arms while one or more of its primary arms also carry an item, it suffers a number of penalties. When using a shield, the chimeran takes the shield's armor check penalty on its attack rolls and skill checks even if it has proficiency with the shield. When using a weapon, the chimeran gains only half its Strength bonus on damage rolls. It takes a -4 penalty on all attacks for each light weapon used in this manner. This penalty increases to -8 for one-handed weapons. The chimeran cannot carry a two-handed weapon with just its secondary arms. A chimeran with at least one empty hand can cast spells with a somatic component. Fearsome Visage: A chimeran with this trait can contort his face in bizarre, terrifying ways, and gains a +4 bonus to intimidate checks. Keen Eyes: A chimeran with this trait usually has large eyes, or eyes with strange pupils, and gains a +4 racial bonus to spot checks. In addition, they gain dark vision 60. Keen Ears: A chimera with this trait usually has pointed ears, swiveling ears, or large, complicated ears, and gains a +4 racial bonus to listen checks. In addition, they gain blindsense out to 30 feet. Sharp Nose: A chimeran with this trait often has an oversized or upturned nose, and gains the scent special quality. Split Mind: A chimeran with this trait has very little outward signs of it, though they may show a slightly enlarged skull, but inwardly, this trait is manifested by having a greater division between the hemispheres of the brain. The two are not truly independent, but the division is enough. A chimeran with this trait takes no penalty for wielding a weapon in his off hand. This does not grant him the ability to make additional attacks with his off-hand weapon. In addition, the chimeran's divided mind allows for some redundancy. If a chimeran with this trait fails a will save, they may choose to reroll the save immediately. They must accept the result of this roll, even if it is lower than the original roll. Stability: A chimeran with this trait has a thumb-claw on their feet that allows them to brace themselves solidly when standing on solid ground, and gains a +4 racial bonus to resist bull rush and trip attempts while standing firmly on the ground. Hold Breath: A chimeran with this trait usually has a large, barrel-like chest and can hold his breath for a number of rounds equal to 4x Con score. Crown of Eyes: A chimeran with this trait usually has extra eyes placed around their head, or snakes for hair, or even short tentacles tipped with eyeballs, and gains a +4 bonus to spot and search checks. A chimeran with this trait gains all-around vision, and cannot be flanked. Naturally Psionic: A chimeran with this trait gains 2 bonus power points at 1st level. This benefit does not grant them the ability to manifest powers unless they gain that ability through another source, such as levels in a psionic class. Fire Acclimated: A chimeran with this trait gains a +2 bonus to saves to resist fire spells or effects. They can exist comfortably in temperatures up to 120° F without having to make Fortitude saves. they are considered to have heat protection 1. Cold Acclimated: A chimeran with this trait gains a +2 bonus to saves to resist cold spells or effects. They can also exist comfortably in conditions between –20° and 90° F without having to make Fortitude saves. Favored Class: Any. A multiclass chimeran’s highest-level class does not count when determining whether she takes an experience point penalty. The chimerans sort of arose from the soup of ideas that have been wandering through my mind while I worked on this process. I'm hoping the mutations are relatively balanced, and that overall, the sheer number of possibilities makes these an interesting, effective race. By the way, if anyone has any ideas for more mutations, please feel free to post than and I'll see what I can do. Here's some of the ones I'm currently considering. Feedback is welcome! Extra Arms: A chimeran with this trait bears a second set of arms just under the first, though they're small and relatively weak. Their weaker limbs are poorly suited to carrying weapons or shields, and do not gain natural weapons (even if the chimeran is under a spell or other effect that grants hand-based natural weapons), but they do an excellent job of providing stability and support to the upper limbs. The advantage here is that you ensure that everyone takes one of the more powerful options, so no one falls into the trap of taking a pair of +4 to a couple of skills or whatever, while you also make sure no one stacks up on a ton of natural weapons. It should also make it easier to balance new additions, because you only have to compare them to options in its subsection. Looking through this, this seems to me to be a reasonable candidate for LA +0 with these options. The Warforged, for example, comes with free AC, a natural Slam attack, Light Fortification, and a smorgasbord of immunities from the Living Construct type. You can actually build a Chimeran with similar stats with this. Hmm. I did have a similar idea when originally constructing it, though I'm thinking that giving them 5 traits would be a little much for LA 0. Even if it's even to other LA 0 races, the fact that you can customize it perfectly to fit your desires makes it probably worth more than LA 0. Anyway, I'm going to repost this over to GitP for more opinions. I don't think there's any combination that's higher than LA +0. Everyone always chooses the race most appropriate for what they're trying to do (where "appropriate" is defined by their goals, of course), so the fact that you can make your "ideal" choices really isn't that big a deal. It's no different than having a series of different races with the various abilities, none of which is more powerful than LA +0. If you could change your choices, then there'd be some concern along those lines, but since these are all chosen at 1st and cannot be changed thereafter, it seems odd to penalize someone (who is not more powerful than LA +0) because of the race's potential versatility. It's not going to affect that character, because he's already locked in. I don't suppose you would happen to have any idea for new mutations? 'Course, at this point, they've got a pretty dang nice selection, but a few more couldn't hurt. By the way, why'd you put web in the weapon category? It was a totally off-the-cuff thing (much like I missed the relative weakness of Chameleon Skin, as pointed out in the other thread), but the reasoning is that it is a potentially offensive ability, thus an attack. In fact, battlefield control is often more important than straight attacks anyway.